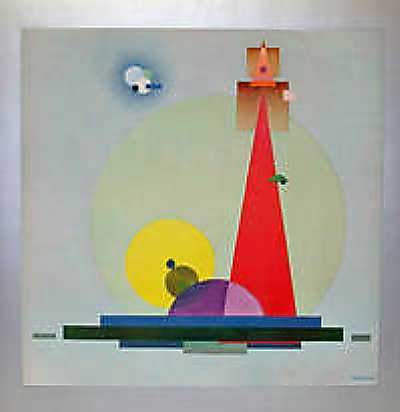 This lithograph, currently being offered by William Reese Co., is by Rudolf Bauer (1889-1953) who was closely associated with Hilla Rebay, director, and Solomon Guggenhiem, founder, of the Guggenheim Museum in New York. Guggenheim financed Bauer's gallery in Berlin. This bold composition is an adaptation of Bauer's 1936 oil painting and was used for the cover of the Guggenheim's catalog for the Second Charleston Show in 1938. 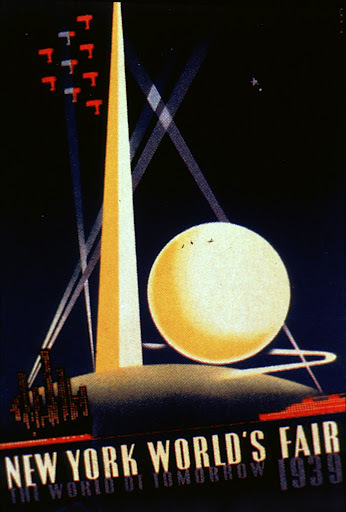 It has been cited as the likely inspiration for the Trylon and Perisphere theme-structures for the 1939 New York World's Fair. Image courtesy of William Reese Co., with our thanks.